You never know where you’re going to see a Porsche sitting around. This one happened to be sitting at the entrance of a campground Paul stayed at over on the Oregon coast this past weekend. 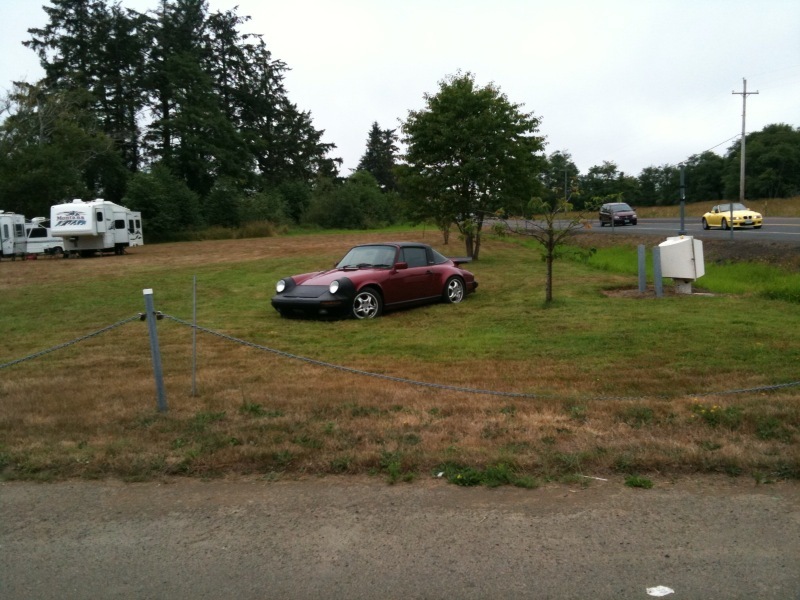 Guess they give Porsches preferential parking when they show up at campgrounds. A dang nice looking 911 Targa. since when is sleeping in your car considered camping? I hope they didnt leave any food in it so “Yogi” and his friends don`t tear the living crap out of it looking for a snack! ‘Campground Porsche’ seems oxymoronic. Like spotting Bill Gates at Wal Mart. Maybe I just went to the wrong campgrounds as a kid. Well, I guess I know what I’ll be doing with the Giveaway Porsche if I win it this week. Driving it. Got t-boned last night on my way home from work by someone who ran a red light. Ended up rolling my SUV and wound up hanging upside down in it. Going off camber on a city street is a really surreal feeling – so is watching pavement close in on your window and windshield. Feeling pretty beat up today, but happy to be alive and not have any broken bones. Holy crap Andrew! I’m glad you’re okay. That had to have been a crazy moment. Porsche’s should get the best parking spot in the house shouldn’t they? hey wait.. isn’t that the same car from Paul’s previous post? Dude, your lucky you didn’t get capped by the owner who packs heat. Scary man.. Scary. Sorry to hear Andrew, Years and Years ago i got that same treatment …only i didnt turtle…. Was the Cadillac i was driving that saved me! Andrew, so glad you are ok!! Different Targa Jeremy, but very similar. Not even sure it stayed overnight, it was gone the next day. Also, the Z3 you see on the highway in the side of the shot nearly took me out when it turned into the driveway. That one I did see the next morning out in the campground field. Apparently, campground to the sports car enthusiasts. as far as sleeping in it – do the seat even recline all the way back? Glad you got thru your accident with nothing major Andrew. Now your Porsche search can begin. Thanks guys – I really appreciate the kind words. @Jeff W – I’ve actually started to look at some Porsches. Although after what happened I was happy to have been in a larger vehicle. Still keeping my eyes open for a sweet Porsche deal though. the more I look at this and the other Targa pic Paul posted, the more I think I want a Targa like this, in this color. Ruthless – aside from some 1950’s vintage model, these mid 70’s Targa’s are my favorites.